many of my students are very successful and are quite taken with the techniques but they are reluctant to do it at home because of having to heat the wax. Decide which melting pot will best suit your needs. How much waxing you do? Do you paint very large or small projects? Do you use large Tjantings and big brushes or small kiskas? Do you need to heat wax rarely or frequently? 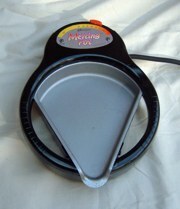 Can you use the pot for other crafts you may have as hobbies for example making candles or soap? Do you use it for teaching or groups or is it for your own personal use? The Ranger Melting Pot: The Ranger melting pot is new on the market and it is ideal for personal use or those who only need small amounts of wax heated. It is small, easy to use and is thermostatically controlled.The heater is not deep so the wax melts very quickly, however you can still use a small Tjanting for your work. The shallow dish would be useful when you are printing with wax. It has a wide for legged base and is very stable. The heating pans can be interchanged keeping one for wax one for soap, chocolate! coloured waxes etc. This could come in handy when you are using pure beeswax on some parts of your picture and a paraffin and beeswax mix elsewhere. If you were painting fabric lengths or large scarves and sarongs, a larger pot would be more convenient. 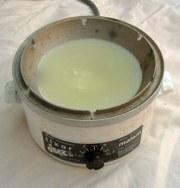 The Tixor Malam Melting Pot This is a professional wax pot with a thermo-statically controlled variable temperature setting up to 135c. It holds up to 0.3 litres of wax, which is not a huge amount, but there is a bigger pot called a Tixor Magnum which is a deeper, larger pot for bigger projects. This pot is very stable and has little places to rest your brush or tjanting. This pot is the most expensive. However it is very robust and will last a long time. I have had my Tixor Malam for over 20 years and it is still going strong. Note: Jill Kennedy is author of a number of books on silk and fabric painting.